New Brother (as Alex calls him) arrived yesterday. He's a little bundle of joy! 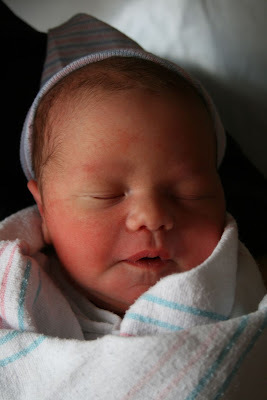 born March 12, 2011 @ 10:49 a.m.
We are grateful for this gift from God. Many blessings to you as you enjoy being a family of FIVE!!! Congrats Nicole! He is precious! Can't wait to read the his birth story (hopefully to come)....Oh how I love a good birth story :) Hope I'll have the same exciting news SOON. What a beautiful gift from God! Completely awesome! Congratulations...well done...and prayers for you all as you navigate the adjustment days ahead!